March 30, 2018  "The initial shock happened when I had to dress," Scott Foster said after the Blackhawks' 6-2 victory. "You just kind of black out after that." June 15, 2015  The Lightning offense struggled, getting just 24 shots on goal. 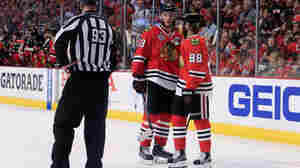 Tampa Bay also won half as many faceoffs as Chicago and had six penalty minutes to the Blackhawks' two. June 13, 2015  The Blackhawks-Lightning series is tied 2-2 going into Game 5 on Saturday. But on the celebrity fan front, it's more of a lopsided Royal Rumble. June 10, 2015  The Blackhawks star knocked in a goal against the Tampa Bay Lightning in the second period, and teammate Brandon Saad added another in the third. The series returns to Tampa on Saturday. June 3, 2015  The Chicago Blackhawks defeated the Tampa Bay Lightning 2-1 in the opening game of the National Hockey League best-of-seven final. The second game is Saturday night in Tampa Bay. June 20, 2013  It took another overtime, but the Chicago Blackhawks defeated the seemingly unstoppable Boston Bruins 6-5 to tie up the Stanley Cup championship. June 18, 2013  The Boston Bruins beat the Chicago Blackhawks 2-0 Monday night to take a two-game lead in the NHL's Stanley Cup championships. 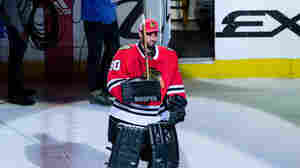 Boston was helped by the peerless performance of goalie Tuukka Rask, while Chicago suffered from the loss of forward Marian Hossa. June 13, 2013  Game 1 of the NHL's Stanley Cup Finals lasted nearly twice as long as a regular game. 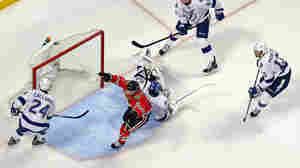 It ended in the third overtime period when the puck deflected off one of the Blackhawks and into the goal. 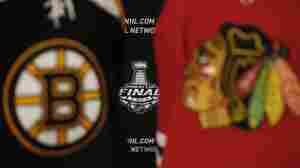 June 12, 2013  The Chicago Blackhawks welcome the Boston Bruins for Game 1 in Chicago.